One of the books I have read that has had really strong influence on me is "How Good Do We Have to Be" by Harold S. Kushner. This book is about perfectionism, the toll it takes on us and how to get past it. Kushner is a rabbi, so much of what he writes is in terms of God and the old testament. However, you don't have to be religious to understand the meaning behind what he says. He sums it up well near the end of the book where he says, "Life is not a trap set for us by God, so that He can condemn us for failing. Life is not a spelling bee, where no matter how many words you have gotten right, if you make one mistake you are disqualified. Life is more like a baseball game, where even the best team loses one-third of its games and even the worst team has its days of brilliance. Our goal is not to go all year without ever losing a game. Our goal is to win more games than we lose, and if we can do that consistently enough, then when the end comes, we will have won it all." I think it's a really powerful and important message. This blog entry is about guilt and shame though, and one of my big takeaways from this book were his definitions and descriptions of guilt and shame. First, guilt is feeling bad for what you do; shame is feeling bad for what you are. So you feel guilty that you kicked the dog in a fit of anger. You feel ashamed that you are a horrible person who would kick the dog. But that's not all of it. My grandmother would tell me, "You should be ashamed of yourself for..." whatever it was I had done. And I would feel ashamed. So shame has a sec ond dimension as well. Not only does one feel shame for what they are, but there is often an external judgment or at least a belief that you are being judged by others that goes with it. 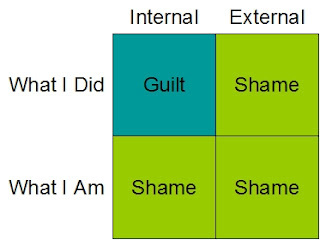 The 2x2 matrix shows how shame and guilt relate to action, being, internal, and external sources. Are Shame and Guilt Bad? My take on it is the following. Feeling shame along the "What I Am" row can often have a negative impact on you. It causes you to hide yourself, even from people you love. It is what causes beautiful young girls to become anorexic. Shame and guilt for what you have done can be very healthy, not just for you, but for society at large. Someone who feels no guilt for his wrongdoings is a psychopath; one who feels no shame for his wrongdoings is a sociopath. That doesn't mean that Johnny Knoxville and his jackass crowd are a bunch of sociopaths. True, they are a really good example of people who have no shame, but the stuff they do is not fundamentally "wrong." It reminds of a trip I made to Rio de Janeiro many years ago. This old guy (maybe my age now), with a pretty big belly (about like mine) was strutting down the beach wearing nothing but a speedo. I remember thinking, "Does this guy have no shame?" Then coming to the realization that in fact he did not have shame. He was what he was and was comfortable in his own skin. It made a huge impression on me. There were thousands of beautiful young people on Ipanema that day, but he's the one I remember. Go figure. Feeling guilt or shame for things you do can be good. If you accidentally run over your neighbor's cat, feeling guilty is understandable. If you kill your neighbor's cat while driving drunk, shame is understandable, because you have broken one of our external codes and you would be judged. You may also feel shame in that case for what you think you are (e.g. an alcoholic). Internally driven shame (shame for how you think others would view you), can lead to cycles of acting out through addictions (binge-purge cycles). On the other hand, if shame is being driven from external forces, e.g., someone telling you how stupid you are, or what a horrible person you are, it may be verbal or emotional abuse that you are experiencing. That's probably a relationship that needs to be fixed or exited.